United States sports betting and horse race betting apps for smartphones. Formerly called Bodog. They re-branded their U.S. operations in 2011. New US players get a welcome bonus of up to $250. Compatible iPhone, Android, BlackBerry, Windows Phone and Nokia. ﻿Bovada, one of the world’s most popular online sportsbook offers players a chance to bet on the go with a mobile betting application that is available via Android, iPhone and iPad and through any other mobile devices. There is no download required. Bovada has a decade plus of experience in the online betting industry as their time as Bodog. Bovada is well trusted among bettors and industry experts and is licensed and regulated by the Kahnawake Gaming Commission and is based in Quebec, Canada. While they are not offer yet via mobile app, Bovada also offers players a full range of online casino games and also an online poker room. The mobile platform at Bovada is not flashy, but it offers bettors the ability to fire off a bet in a matter of seconds. After logging in, a series of buttons on the main page signifies each sport. After clicking your chosen spot, a list of betting markets will then appear. After a player chooses his betting market and chooses a specific wager - that bet will be added to the bet slip. The bet slip will keep track of the wagers ready to be placed and will allow users to formulate parlays and teasers. Once they finalized their wagers, bettors should click the “Place Wagers” button in the bottom right of the screen. 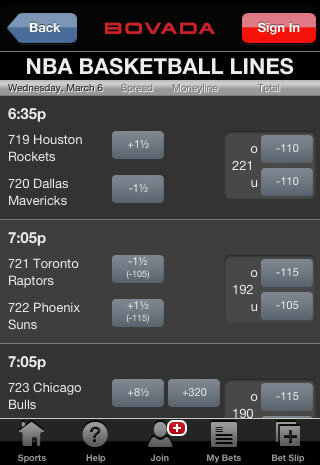 Players can also deposit via the mobile betting app at Bovada. Deposit through credit card is available if players click the “Account” button after logging in. Credit card is the only available method for deposit via mobile betting. Depositing through credit card will fund the account instantly. Like the regular site, bettors can check their open bets and their best history. They can also contact Bovada by phone or via email if they need assistance. 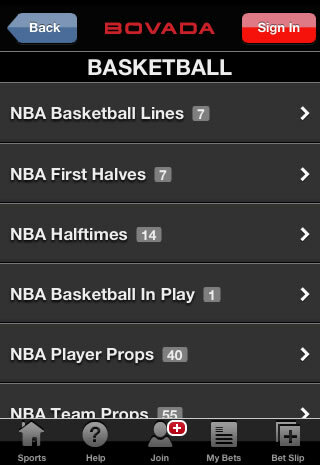 Bovada’s mobile site has a sleek look and performs well. Pages load quickly, making it easy to jump around the site and look at all the betting options. 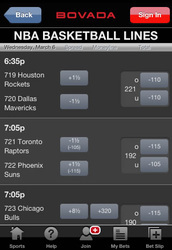 With Bovada’s quick loading times and easy to use menu, bettors can place a wager in under 30 seconds. The layout itself is straightforward and easy to navigate. The sportsbook uses a black and white, background and text layout and blue buttons to place wagers. They have just enough contrast to make it easy on the eyes but to also highlight specific options. Bovada offers newly depositing players a 50% First Deposit Bonus up to $250 in Free Bets. This bonus has a 3x rollover which is among the lowest for online bookmakers. Bovada is a bitcoin friendly sportsbook that processes bitcoin deposits and withdrawals at no charge. Bovada is famous for yearlong promotions for many different sports, most of them coming around the start of each major sports season or for championship games or big events, such as the NFL’s Super Bowl or the NCAA’s March Madness. In addition to sports betting promotions, tons of other bonuses are offered to casino and poker players. 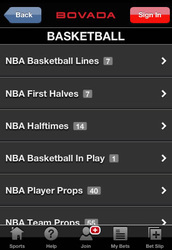 Bovada’s mobile betting platform offers bettors their first full slate of action – even to bettors on the go. Everything is available to bet, including live betting, all leading US sports, plus international contests. 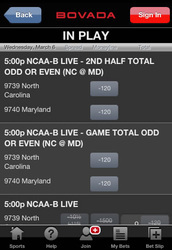 Betting parlays and teasers are easy to do via the mobile betting site. Want to bet futures, along with player and team props? Bovada has you covered. Though Bovada is a primarily US facing sportsbook, the amount of international wagering opportunities are impressive. 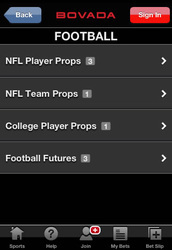 Of course, for US bettors, their selection of prop bets and futures is unmatched by most other online sportsbooks. Bovada adding an online betting platform to their repertoire is a blessing for American sports bettors. They were already one of the most trusted sites with the most options, and now they have become even more accessible. 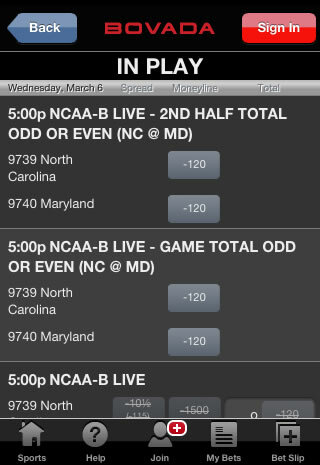 As we mentioned above, Bovada’s mobile betting site is nothing ground breaking, but that is fine. It is user-friendly, stable, and bettors can deposit via credit card instantly. From there, in just a few clicks, they can place a wager. 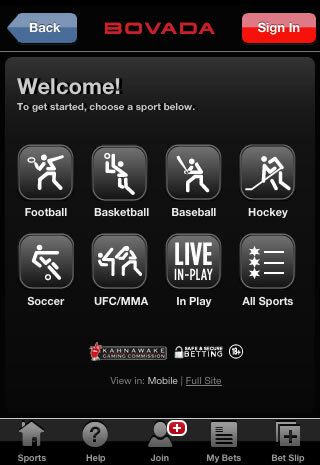 Bovada has simply taken their great product and moved it to a mobile platform, and that is more than fine with us.